For the first time, South Korea has been knocked from the top spot in the rankings of mainland Chinese WeChat spending over the long Labor Day weekend as Hong Kong takes its place and Thailand sees the fastest growth, according to a report by WeChat on cross-border spending. The sheer ease of overseas transactions using WeChat, avoiding the need to change money and worry about exchange rates, is one of the main reasons for the continued growth of spending by Chinese tourists abroad. The WeChat users pay in RMB and the merchant receives the payment in local currency. 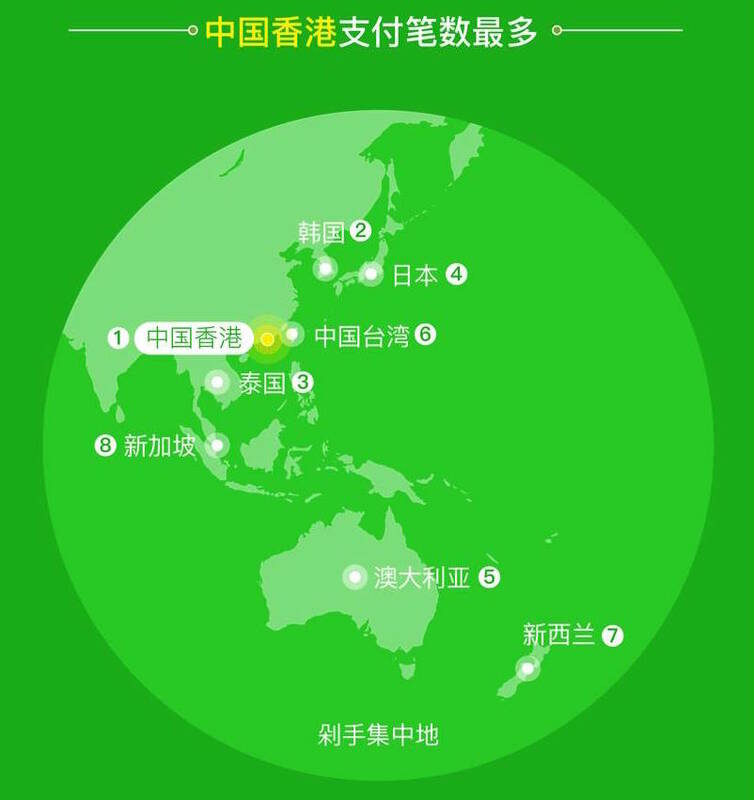 WeChat payments can now be accepted in 12 countries and territories and in 11 currencies. Over the Labor Day weekend of April 29 to May 1, a “little long holiday” in China, the highest cross-border spending was in Hong Kong, followed by South Korea, Thailand, Japan, Australia, Taiwan, New Zealand and Singapore. Hong Kong’s Sasa (莎莎) cosmetics chain took the most WeChat business on May 1st with 70% of its sales on the day going to mainland WeChat users. Beyond simply adopting the payment method as a way to make shoppers feel at home, Sasa was also running promotions when shoppers used WeChat wallet. In terms of South Korea’s fall from the top spot, what the report does not mention is the fact the Chinese government has banned tour groups from going to South Korea as part of an ongoing diplomatic dispute over the US military installing an anti-ballistic missile battery in the country, to which China is vehemently opposed. Thailand has seen the fastest growth in WeChat spending of all overseas locations that accept it. Spring Festival this year say the growth of 104% on 2016. However, this year China’s New Year festival didn’t mark a peak as spending continued to increase. Spending at Thailand’s new year festival, the water throwing holiday of Songkran in mid-April, was up 38% on Spring Festival – six times higher than in 2016. The biggest flows out of China of WeChat users – not necessarily spenders – were from Guangdong to neighboring Hong Kong, from Shanghai to Japan, Beijing to the US and Zhejiang to Italy. Fujian has pushed ahead of Zhejiang and Jiangsu this year as an exit province and there was a flip in the gender balance of WeChat users going abroad for the holiday with males now taking the lead at 53.3%.